Text anywhere, anytime and on any device! mysms is wherever you are. mysms texting app is available for desktop, tablet and smartphone - an app for all the devices you use everyday. Use mysms on your Windows PC, on your Mac or on the web in your preferred browser. 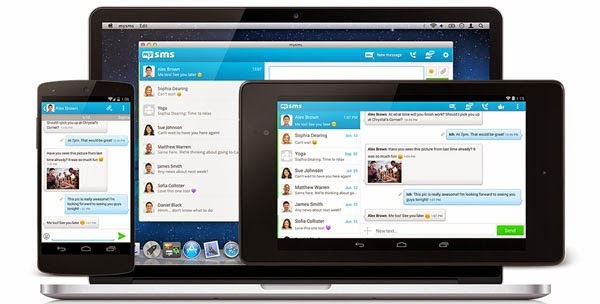 mysms is more than a tablet texting app! You can also synchronize your calls to your tablet. When a call reaches your phone, your tablet starts ringing, even if you are surfing the web. mysms is your new default SMS app for Android with a great bunch of features like free messaging to mysms users, multimedia support, group messaging, widgets, themes and much more. You can start sending and receiving SMS on your computer right away. Your messages will stay in sync with your phone. Choose to send free messages to other mysms users or text via your carrier - just like using iMessage. Get notified on your computer and tablet when a call reaches your smartphone. Choose your favorite device and use mysms to text on your smartphone, computer and tablet. Unlike many other messaging apps, mysms uses your existing phone number and sends texts via your Android phone. Put your mind at rest when texting with mysms. All messages are encrypted and saved securely in the cloud. Stand out from the crowd by using the style that suits you most. Customize your mysms app with your favorite colors.